I sit here with my heart aching so. I had to say goodbye to my baby yesterday after 15 years and 4 months of "protecting me." My husband said it best just a while ago. He said "His (Bodie's) whole purpose in life was to "protect" mommy. And he did ferociously for all his life right up till the end. Even when he could no longer stand, he would growl at anyone or thing because he wanted his mommy all to himself. 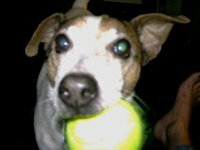 He was a Jack Russell Terrier born on May 2, 1995 in Mt. Sterling, KY. We picked him up when he was 6 weeks old and he immediately attached to me. No obedience training, professional or on our part could break that bond he had. You will be forever in my heart. I miss you so, my baby. Today is 6 years since I had to say goodbye, Baby. There still isn't a day that I don't miss you and long for you. It's so hard to be here without you. I keep wanting you here. I know that can never be. I just think of the day that I can see you again. That's what I hold onto. Today we said goodbye to Simon. He is now with you, Bodie. The two of you can be together again although neither of you were crazy about being together in life. You will be happy and healthy in Heaven. Even though it's been almost 3 years since we said goodbye, my baby, there's not a day that passes without me missing you. Take care of Simon until we can all meet again. It's been 1 yr since you left, Bodie. I've been told over and over that it gets better. I admit that at times it is easier, but it still feels like it just happened. I know you are so much better off, but I miss you so much I can hardly bear it. Not a day goes by that I don't wish so badly that you were still with us. During your 15 years, I couldn't imagine life without you and even though I knew that that awful day would come, I somehow managed to think it wouldn't happen to you. Your personality was that of a little person, your expressions of happiness, sadness, annoyance, impatience and, yes, anger made it hard to think that you were anything but my little boy. I still have your ashes sitting beside my bed. I know I said I was going to spread them in your woods that you loved so much, but selfishly, I can't bring myself to do it. It feels like I'd be losing you all over again. There will never ever be another dog that affected my life like you did because there will never be another like you. I know you are healthy and happy again and that's what brings me comfort now. I hope you understood when you were so sick and feeble that Mommy just couldn't let you go. You were my protector and baby right till the end. I know you knew how much I loved you, and I know how much you loved me. We were side by side for over 15 years, and it will take me a lifetime to not feel the emptiness of you not being with me. This house will never be the same. I love and miss you so. Bodie, the baby. Well, it's been 6 months now and I have to say it has gotten a little easier, but I still miss you so much. I still wake up in the night and look for you until it hits me that you are gone. This spring will be so hard because it was our favorite time of the year. We could finally get outside and you could stay as long as you wanted to run thru the woods and find your tennis balls hidden everywhere. I will be finding them alone now and cry each and every time. I know you couldn't be with me forever, but why couldn't it be longer? The day you had to go, I felt like you had just found me even though it had been almost 16 years. I may miss a month here and there adding to your page, but that doesn't mean I don't miss you every single day. I love and miss you so, Bodie. It's hard to believe that you've been gone for 4 months now. This was the first Christmas without you in 15 years. I think about how you knew which presents were yours and how you could open them to the amazement of everyone that watched you. I can't really say that it's gotten easier with these months passing or that I've thought of you any less. I still cry almost every day, just missing you so badly, but I know you are in a better place and that you are happy and waiting for the day to see your mommie once again so we can play like we always did every day. You were such a happy little 'dog boy'. I know that no matter how much time passes, I will always be saddened by not having you by my side. I love and miss you so much I can't put it into words. I will see you again I know, but in the meantime be the happy little guy that you always were. It's kinda ironic that it's been 3 months since I lost you and it was a Friday just like today. I still cry every day for you, my baby boy. I miss you more than words could ever express. I'm sorry that I haven't been able to spread your ashes in the woods like I promised. It's like I'm losing you all over again. I will though someday because I know you would want that. I'm just being selfish like I was when I hung onto you too long before I ended your suffering. I know that you are happy and healthy once again in heaven and that you are waiting for me with your little stubby tail wiggling at the sight of seeing your mommie. You are still everywhere I look in this house and there isn't a stack of picture I go through that isn't mostly of you. I had you for over 15 years, but that wasn't long enough. I will see you again my baby. Until then, be happy. It has been 2 months today since that awful day in Sept. and I still have your ashes sitting watch over me. I know I should scatter them over your woods, but I feel like I'm letting you go all over again. Not one day goes by that I don't cry for you and miss you so badly, my baby. I keep hearing that I need to get a new puppy, but I just can't bear the thought of it. Your loss is still so fresh, I don't feel like it would be fair for him or her. I would want him to be just like you, and I know there will never be another you. You're still everywhere I look in this house. Everything reminds me of you. Maybe some day I will be able to open my heart to another, but not yet. I know that it will get easier, but it hasn't yet, and selfishly I just want you back, but healthy and not like you were the last few months. The thought that I will see you again keeps me going for now because I truly do believe that we will be together again some day. I will once again see how your eyes light up at the sight of your 'mommy', and you can once again protect me. Sept. 10th was the saddest day of my life when I had to say goodbye. You held on right till the end. I miss you so so much. I'm glad I am able to bring some comfort to you. I picked up Bodie's ashes yesterday and it was almost as sad as that awful day Sept. 10th. He had 5 acres where he could 'read the newspaper' several times a day until the last few months of his life. Now he can catch up anytime he wants too! It wasn't him to be in one spot so I felt it only fair to allow him the run of the place again, and forever. Still so very much missed. I neglected to thank you for your comments on Sadie and your poem. I am so sorry for your loss. I never thought that the animal-human bond was so strong. Sadie was my baby girl, so I understand your attachment to Bodie. They are unique. I am told it will get easier with time. Thanks for your comment about my loss. Your Baby loved you and still does. You will meet again. Thank you for taking the time to comment on my memeorial. I'm so happy that reading this has brought some comfort to someone else. They say the grief gets better with time. I sure hope so because I miss him so much I can hardly bear it. That poem is beautiful. I lost my baby just a few weeks ago and it helps to read others' stories. It lets you know you're not alone in your grief. Someone posted a comment on my story and the simple words they wrote touched me so deeply, I put them on my baby's gravestone: Love never dies. God bless you and your Bodie. May He be with you and all of us who are brokenhearted.